As usual, @evleaks from their twitter account share some leak images of upcoming smartphones that will be launched soon later. And now, they revealed 2 images of Nokia Lumia 1020 a.k.a EOS/Elvis for AT&T Provider that will be launched at "ZOOM Reinvented" event on 11th July 2013 in New York City. 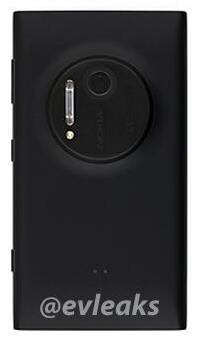 From the leak images, the body of Nokia Lumia 1020 is similar to Nokia Lumia 920 but with bigger screen. 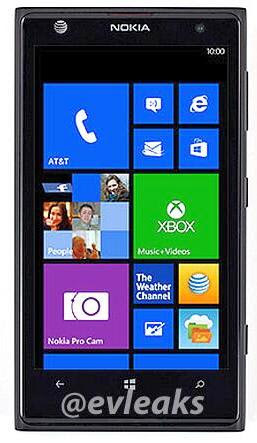 The material should be same like Nokia Lumia 920 that use poly carbonate for the body. On the back side, you will see bulky camera frame for main camera with 41 Megapixels Zeiss, Xenon flash and LED Flash. There is a new "Nokia Pro Cam" application - an exclusive lens application only for Nokia Lumia devices. To prove this leak images, let's join #ZOOMwithNokianesia on twitter and ZOOM Zone only on nokianesia blog. We will reporting "ZOOM Reinvented" event LIVE from New York City. There will be the 1st Hands-on video, Live Tweet and many more. Stay Tuned on 11th July 2013 10PM GMT+7 (WIB).